Five Times Pay by Wager Works is a very popular high volatility slot game! However, this game is for relatively seasoned players who willingly forego frequently offered smaller pays in their search for bigger awards. And the bigger awards means 5 times and 25 times bigger! 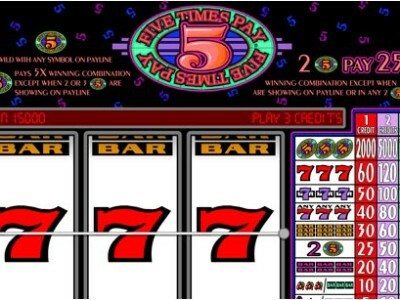 Five Times Pay is a 3 reel 1 payline slot with coin denominations ranging from 25c to $5, and a wager of 1 to 3 coins. It offers a wild multiplier whereby your wins can get multiplied by up to 25 times. 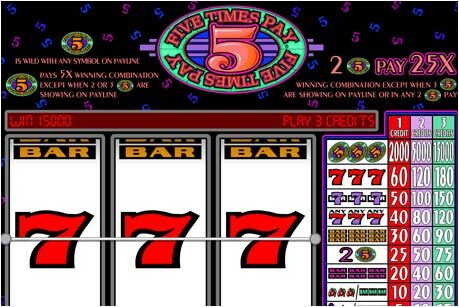 To win the top jackpot of 15,000, you have to line up 3 Five Times Pay logos while playing at the maximum bet. If you are not playing at the maximum bet, the jackpot falls to 5,000 for 2 coins and 2000 for 1 coin. Five Times Pay is both the wild and the multiplier symbol. Thus it can substitute any other symbol; two such symbols multiply the award by 25 and one by 5. However, all payouts other than the top jackpot are pretty small, only up to 180 coins. The audio-visual effects in the Five Times Pay are minimal and traditional. Such slots are perfect for newcomers who want simple slots without getting distracted by too many complexities. This game has one screen and the whole game is played on it. On the whole, Five Times Pay is a good classic slot. Just don’t expect an immense amount of features in it.